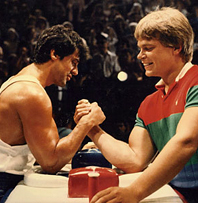 Some noted top arm wrestling competitors include John Brzenk (hailed as the greatest arm wrestler of all time), Alexey Voevoda and Magnus Samuelsson. John Brzenk is known mostly for his array of techniques which change almost every time he is engaged in competition, even with the same opponent within the same match. As of Summer 2008, John Brzenk is ranked 1 in North America. A professional bobsleighersince 2002, Voevoda won silver in the four-man bobsleigh at the 2006 Winter Olympicsin Turin. He also won a bronze in the two-man event at the 2008 FIBT World Championshipsin Altenberg, Germany. Voevoda holds a good deal of recognition as a professional arm wrestler, having secured several Russian arm wrestling championships. Despite his defeat to Travis Bagentat the 2003 WAF championship, he rebounded and won the Zloty Tur 2004 cup one year later, defeating high level armwrestlers such as Bagent and John Brzenk. Voevoda reclaimed the WAF championship in 2004 (left- and right-handed) and won the European Championship the same year. After a left hand vendetta match with Alexey Semerenko, Voevoda took a break from his professional arm wrestling career to return bobsleigh training until 2007. As of 2007 Alexey Voevoda has returned to the arm wrestling scene once again. After that short comeback he resigned from armwrestling scene due to his bobsleigh training. Magnus Samuelsson was the winner of the World's Strongest Man competition in 1998 in Morocco. Renowned for his longevity in the sport, he holds the record for reaching the WSM finals 14 times, a feat which he achieved over a fourteen year span from 1995 to 2008. Magnus is known for having the worlds strongest arms and has earned the nickname "The King of the Stones”. On this list we should add names of a current European and world champions, like Denis Cyplenkov, Devon Larratt, Pushkar Andriy i Sylvain Perron. Ron Bath is known for his use of the Top Roll technique which emphasizes a 'roll' of the wrist as he brings the opponent's wrist down. Travis Bagent, like Brzenk, is known for his wide array of techniques, coupled with his massive strength and explosive style. Many of Bagent's matches have ended in seconds. However, Bagent is most well known for his colorful remarks and rather rude comments against his opponents. Other competitors such as Matt Girdner, Michael Selearis, Marcio Barboza, and Christian Binnie, are known for their reliance on strength, coupled with the hook technique, where the wrist turns into a hooked grip after the referee has started the match. " Britain's most successful Armwrestler and former two time European and World Middleweight Champion Neil Pickup is one of today's leading Armwrestlers widely recognized as having originated and developed techniques to suit the genetic make up of individual Armwrestlers. Neil Pickup has enjoyed an Amateur and Professional career spanning more than 20 years during which time he has won more than 60 International titles across 5 different weight classes on both his right and left arms, while also training numerous World Champions both male and female. This success has been largely attributed to his technical prowess, experience and understanding of this exciting combat strength sport in which the athletes whole body must be utilized effectively as a lever. Armwrestling can be traced all the way back to acient Egypt where a painting depicting a type of arm wrestling was found in an Egyptian tomb dating to about 2,000 B.C. The modern sport is based on a Native American game. In fact, it was usually called "Indian wrestling" when practiced by frontiersman during the 19th century and by children in the 20th century. In addition to being a semi-popular sport among high school and college students, arm wrestling was a tavern sport and the first organized competition was staged by a journalist, Bill Soberanes, in 1952 at Gilardi's Saloon in Petaluma, California. Over the next ten years, it became bigger and bigger. In 1962, Soberanes and Dave Devoto moved the tournament to a large auditorium in Petaluma and renamed it the World Wristwrestling Championship. The sport got a major boost from "Peanuts" cartoonist Charles Schulz in 1968. Schulz did a series of comic strips in which Snoopy was headed to Petaluma to try to win the championship. Largely because of that publicity, the championship was televised on ABC's Wide World of Sports in 1969 and became an annual event on the program for 16 years. The American Armwrestling Association, now the American Armsports Association (AAA), was organized by Bob O'Leary during the 1960s. It now has 56 member associations across the country. O'Leary was also largely responsible for the founding of the World Armsport Federation (WAF), with the United States, Canada, Brazil, and India as the first four members. There are now more than 70 member countries. The year of 1979 was a very busy and important year and that same year, John Miazdzyk hosted the very first World Armwrestling Championship in Canada. Four countries were represented.